Last week, I talked about my husband’s adventure in the emergency room with his collapsed lung. Let me say that it’s not an experience I would wish on anyone. But as doctors and nurses were rushing about preparing the chest tube and snapping X-rays, there was one person who I wasn’t worried about in this chaos. The kind lady from billing. It wasn’t that we had a huge wad of cash just sitting around, waiting for a hospital bill. I knew what our deductible was. Our insurance would pick up the rest no matter how long my husband was stuck in the hospital. Having insurance in place to take the worry away about potential costs, I could focus on the important thing. In this case, it was talking my husband through having a tube stuck in the side of his chest. Insurance gives us confidence to move forward and focus on important things. Goals. Dreams. Family. Germany wants to build the confidence of its people. So it has called its gold home. 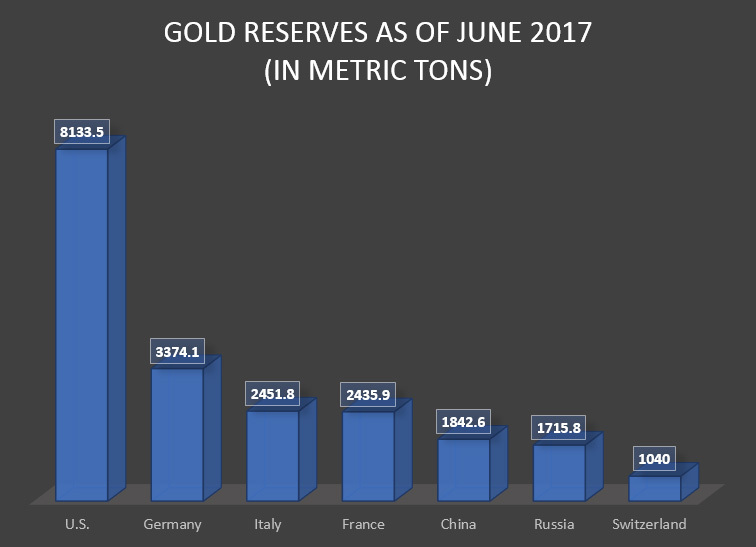 As part of a five-year program, Germany has brought home 374 metric tons of gold from vaults in Paris. That’s $15 billion worth of the yellow metal. The final shipment of 91 metric tons was moved earlier this year to Frankfurt. In addition, Germany moved 300 metric tons from New York to Frankfurt. Some of Germany’s gold remains in the U.S.
Now, more than half of the country’s $140 billion stockpile of this precious metal is home in Frankfurt. Germany moved most of its gold to London, Paris and New York during the Cold War to protect it from possible theft by the Soviet Union in the event of an invasion. That safe haven for wealth doesn’t just work for large countries. The commodity is a critical component of your portfolio as well. Gold is a wasted opportunity. Gold has no place in the investment world today. But for all the hate that investors pile on, the precious metal continues to be a hedge against volatility in uncertain times. It is a place to store wealth. An insurance policy against disaster. Just seven countries hold more than 20,993 metric tons in reserve. That’s physical gold stored in vaults around the globe! These same countries are struggling with debt, slow economic growth, high unemployment, high health care costs and much more. Couldn’t all this gold be better served tackling these problems rather than sitting in vaults if the precious metal is so worthless? But the yellow metal isn’t worthless. It isn’t an eyesore. Holding it makes us feel safe. It means that we have a backup plan in place in case something goes truly wrong, because we have always valued gold. It’s unrealistic to expect gold to rally 100% in a year like a flashy tech stock, because that’s not gold’s job. Gold’s job is to steadily grow in value when people lose confidence in their government, currency or even economy. Adding gold to your portfolio doesn’t have to be a difficult task. Some investors prefer to invest in gold mining stocks, but they offer an extra element of risk. With a gold miner, you’re not purely investing in gold, but in a company that is digging for the metal. You could be contending with management and debt issues that impact the performance of the stock. Another option is to invest in an exchange-traded fund (ETF) such as the SPDR Gold Trust (NYSE: GLD). The ETF simply follows the price of gold, but you don’t hold the physical commodity. And a final option is to buy bullion. Regardless of which option you choose, it’s critical to get your gold insurance policy in place to protect your portfolio. The next disaster is always just around the corner. P.S. The declining standard of living in America shows the direction our government seems destined to pursue. Because of the risk this creates in our financial lives, we all need to have a Plan B in place. Bob Bauman’s Passport Book reveals why millions of people already have their second passports, as well as how you can join them in becoming an independent world citizen. To see how this essential guide is helping Americans have lives full of freedom and abundance, click here.